Joe DeMers - The Number One Beta Marine dealer in the USA. We sell all our products at the deepest discount in the USA. Sailboat repowering is a specialty. Consider having the engine, drivetrain, and associated systems evaluated by a professional marine diesel mechanic. This inspection process will produce much information concerning the most expensive parts of the vessel, and will usually result in a price reduction on the boat that more than covers the inspection fee. This procedure will also help to avoid the unfortunate circumstance of buying a boat only to discover that the engine, transmission, prop shaft, fuel system, or exhaust system, etc,etc, require extensive repairs. Please consult with me, Joe DeMers, BEFORE the final payment on your dream boat! I will work FOR YOU to ensure you do NOT pay too much! 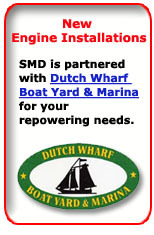 Consider SMD as your source of personalized marine service. 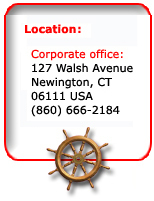 SMD will evaluate your boat's mechanical needs, suggest and design system upgrades, order parts and materials, repair or install mechanical equipment, and keep you informed throughout the entire process. A seaworthy vessel, at a reasonable price, is our goal.